Anglophiles delight at this authentically British cruise line! These opulent yet intimate cruises whisk you away on a voyage to the earth's most impressive and remote locations and appeal to mature passengers looking for a cruise experience that is more traditional and leisurely. Let the international crew aboard Cruise & Maritime Voyages' ships present you with polished service, luxurious facilities, varied cuisine and a choice of entertainment and destinations. On board many of the ships in the Cruise & Maritime Voyages fleet passengers are invited to the exclusive Chef's Table for a very special multi-course gastronomic experience. In contrast to the more formal evening meals, buffet style meals are also available for a more casual dining experience. Cruise & Maritime Voyages ships glide through swathes of Amazonian jungle as well as visiting ports as diverse as Perth, Sydney, Dubai and Bali on their varied itineraries. Enjoy a varied entertainment program that ranges from lectures from local experts and arts and crafts classes to raucous cabaret and live music performances. Many of the ships in the Cruise & Maritime Voyages' fleet feature a resident pianist and a violinist and you can meet famous personalities and encounter up and coming comedians. A serene, adults-only ship, the Magellan offers a traditional British cruise experience to iconic destinations worldwide. Enjoy the spacious layout, intimate atmosphere, and personalized experience of this premium cruise ship. Experience a traditional British cruise with the Marco Polo. 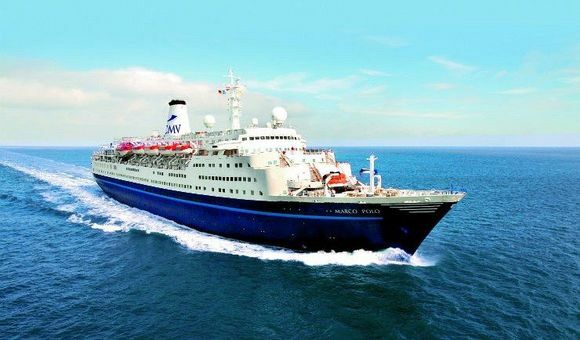 A beautifully restored ocean liner, the Marco Polo retains its traditional charm while meeting all modern standards of safety and comfort. The latest ship to join the Cruise & Maritime Voyage fleet, the Columbus is a medium-sized premium ship sailing to deepwater destinations all over the world. Primarily aimed at British cruise passengers, guests of all nationalities will be charmed by the traditional onboard atmosphere and relaxed cruising style. Experience an authentic, traditional cruise onboard the Astoria, one of the most beautiful and historical ships in the Cruise & Maritime Voyages fleet. First launched in 1948, she was rebuilt in 2013 to meet the latest standards in comfort and safety. Now she offers one-of-a-kind voyages throughout the British Isles and Europe.